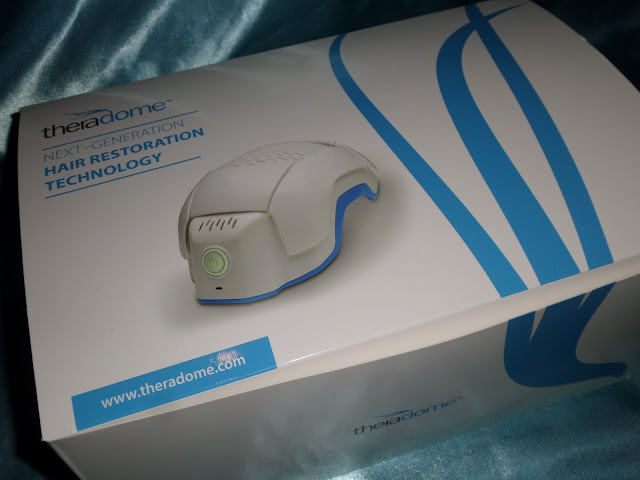 Where Roots And Wings Entwine: Theradome™ LH80 Laser Hair Growth Helmet – an introduction and initial impressions. 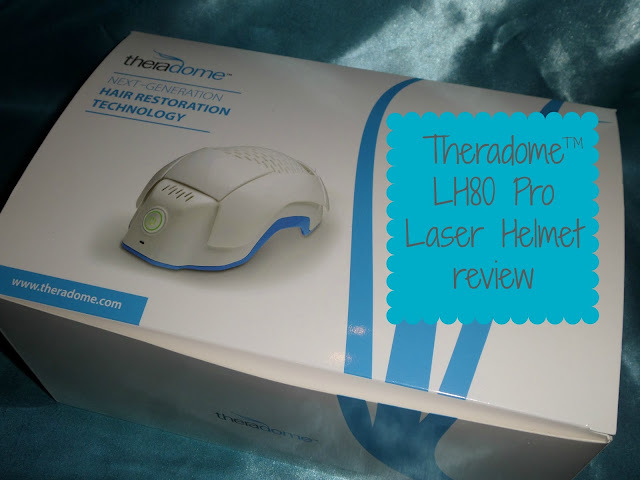 Theradome™ LH80 Laser Hair Growth Helmet – an introduction and initial impressions. A person’s body insecurities can have a surprising effect on confidence, happiness and mental well-being. Whilst we may not like to openly admit it, many people are not truly happy with at least one part of their body. Be it weight, body shape, lack of muscles, a wonky nose, height, or another body part or characteristic, feeling unhappy about how you look can have a strong influence on how we feel and act. For me my weight and excess body hair thanks to PCOS are my body insecurities and what I dislike about myself. Over the years I have tried a whole host of ways to improve and change what I dislike, slowly learning to love myself for who I am and being happy with who I am. Yet there are days when rising above it can be hard and I look in the mirror or see a photograph and cringe a little. As someone who has had their fair share of body issues I can relate and empathise with how strongly body insecurities can affect happiness, confidence and mental health. Sadly I have witnessed first-hand the affect that body insecurities can have on a person, by seeing my beloved partner Lee suffer from a lack of confidence and feelings of self-consciousness due to a body characteristic of his he hates with a passion. Having expressed his consent to me writing this, this post is about his personal insecurity and hopefully the start of changing things for him. Lee’s body issue is his hair, or lack of hair that is. Whether it is due to stress, hormones, nutrient deficiency, genetics, or another reason; Lee unfortunately suffers from thinning hair. The thinning hair is so far restricted to the top of his head, but to Lee it affects the appearance of his whole hair style….or as he believes thanks to thinning hair causes him to have no hair style to be proud of at all. To be honest looking back to when I met Lee a little over 6 years ago I can’t really remember whether his hair was fuller and not thinning or whether it was already as it is now. 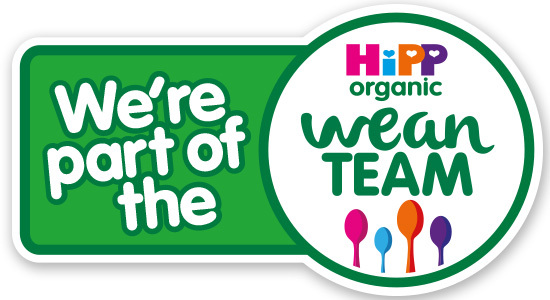 Lee likes to jokingly argue that he had a full head of hair until he met me, with me giving him reasons galore to pull his hair out and plenty of stress over the years to cause his hair loss, with our 2 little munchkins now also providing added worry and helping him age! Being a family on a tight budget we unfortunately could not afford for Lee to go to a clinic for costly hair growth treatments so sadly he has had to put up with the upset of thinning hair, often keeping his hair longer than he would have pre-thinning hair to ‘comb-over’ what hair he does have to hide the bald patches or wearing a hat to hide his hair shame from sight! Whilst I do not care about Lee’s thinning hair loss and do not even notice it, only seeing the man I love, as I know it is a sensitive issue for Lee when I recently heard about an opportunity connected to hair loss I just had to find out more in the hope of helping Lee with his thinning hair which if improved would hopefully help with his happiness, confidence and mental health. 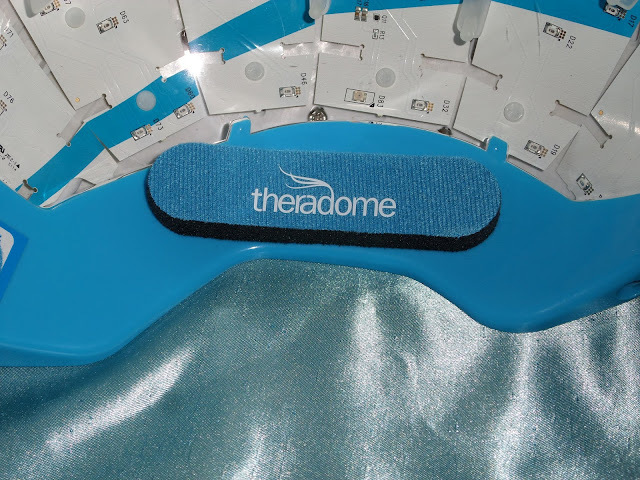 Theradome™ are creators of the LH80 Laser Hair Growth Helmet which is designed to promote hair growth and reduce hair loss. 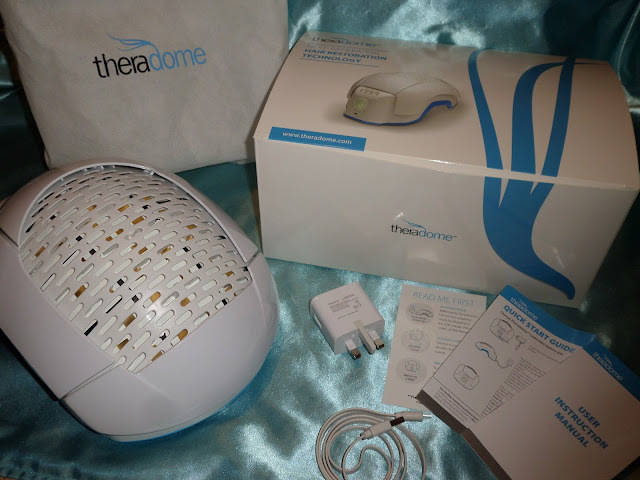 Distributed by a Trichologist led Laser Hair Growth Company with over 20 years of expertise in hair loss treatment, The Theradome LH80 provides “Wearable Laser Hair Grow Therapy” for both men and women with a simple push of a button. In the hope of improving or at least slowing down Lee’s thinning hair he happily agreed to test out the helmet once we heard that he would be a suitable candidate for the treatment. 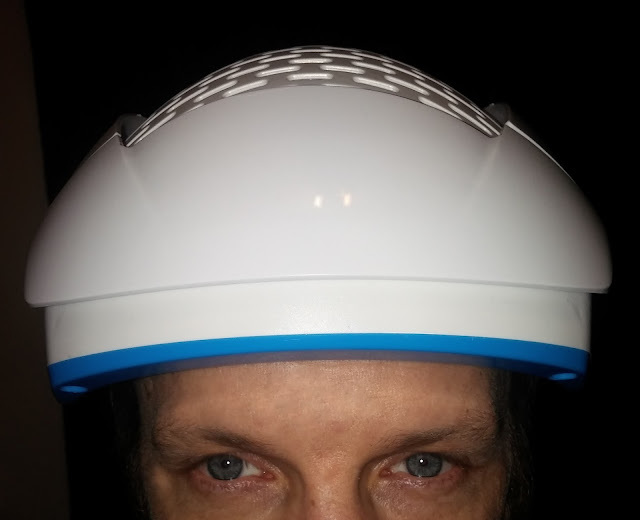 Having seen a number of results from the treatment by other users online, Lee does feel hopeful that he will see an improvement with his thinning hair by using the helmet over time. To keep track of whether there is any improvement with Lee’s hair whilst using the helmet for laser hair growth treatment we have taken photographs of his hair to keep an eye on any developments, improvements or lack of if that is the case. 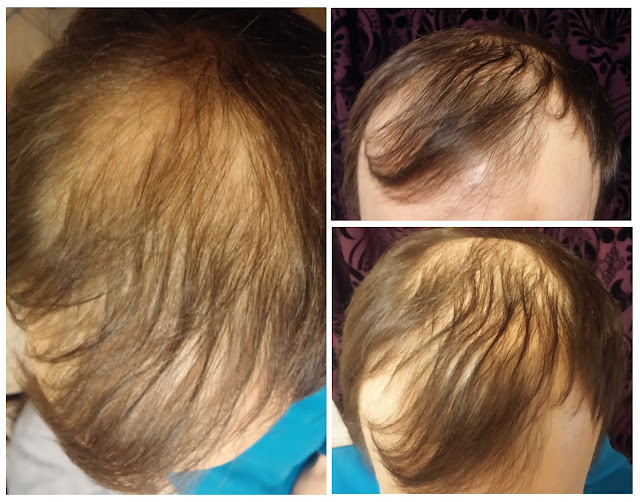 We are well aware of the fact though that effectiveness of the treatment and any signs of improvement will take time and that the helmet will not be a magical, overnight solution to his hair woes, with a minimum of 4 months treatment needed before a visible improvement in hair growth is noticed. Since receiving the LH80 helmet, Lee has been using it and experiencing the laser hair growth treatment for a week or so. Being a bit of a geek and admirer of science and technology, Lee appreciates the fact that the device is developed by former NASA biomedical engineer Tamim Hamid and is FDA approved. 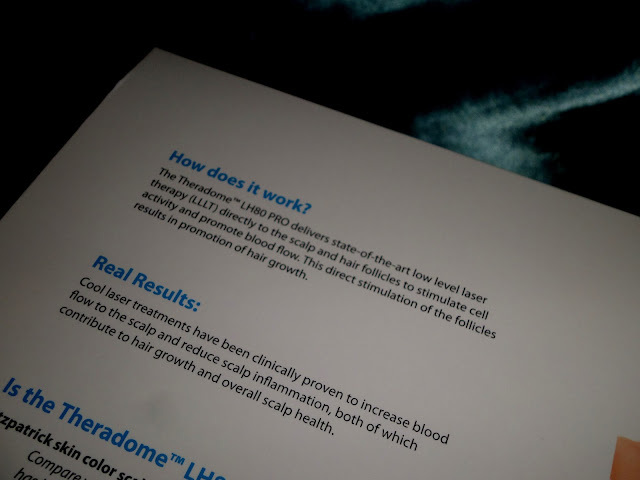 He also admires the fact that the device has been designed so that the 80 lasers at a wavelength of 678nm target hair follicles to stimulate cellular repair, encourage hair growth and improve overall scalp health. The helmet looks like a flashy, high-tech bicycle helmet which Lee has been more than happy to have adorning his head, especially if it helps improve his hair. Now that Lee has used the helmet for a few sessions he has found the helmet to be lightweight, comfortable to wear especially thanks to Velcro foam pads that can (if needed) be fitted inside the helmet for added comfort, and a great fit for his head. The helmet’s design features grooves in the top to provide ventilation for optimum operating temperature – the helmet generates less than 1 degree Celsius of heat after a full 20 minute session. 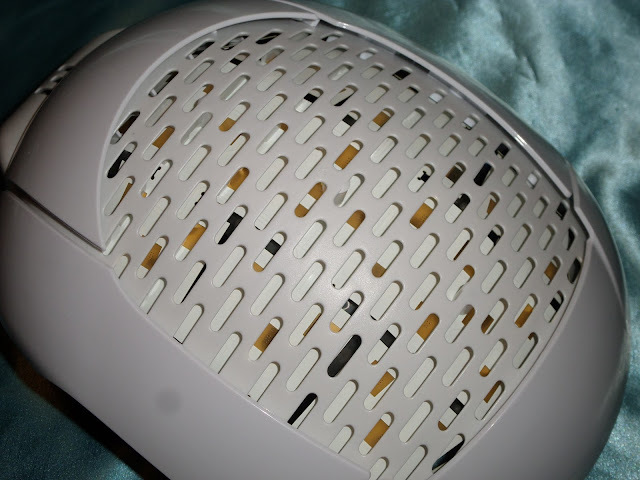 Inside of the helmet are soft rubber pegs that are designed to help part the hair to improve laser treatment to the scalp. 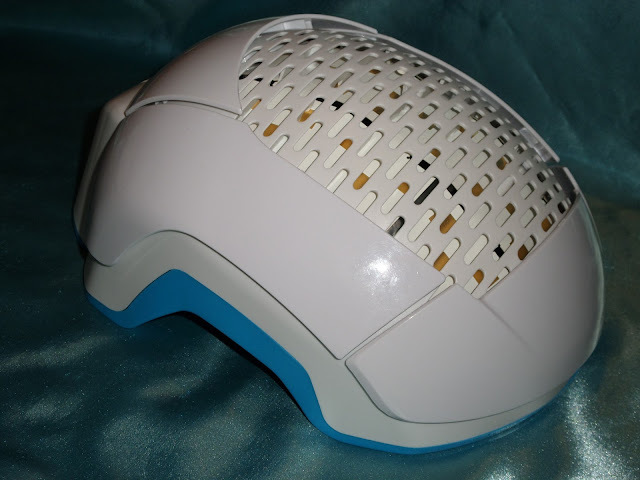 The helmet’s design provides treatment for a large area of the head which is beneficial is hair thinning/loss is spread across a large area rather than concentrated in one single area. To protect the lasers they are encased in a protective clear plastic shell which is beneficial for cleanliness and hygiene. 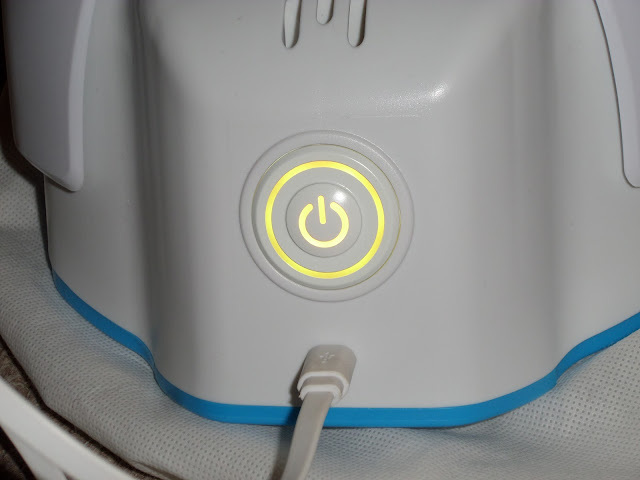 The device also features inbuilt proximity sensors which detect when the helmet is being worn to activate the lasers, thanks to this feature if the helmet is removed before treatment is completed the lasers are automatically turned off. Using the helmet is a simple task, all he needs to do is pop it on his head and press the large button on the back of the helmet. Along with the red laser s lighting up, the clever helmet confirms that the session has started thanks to a lady stating “treatment started”. 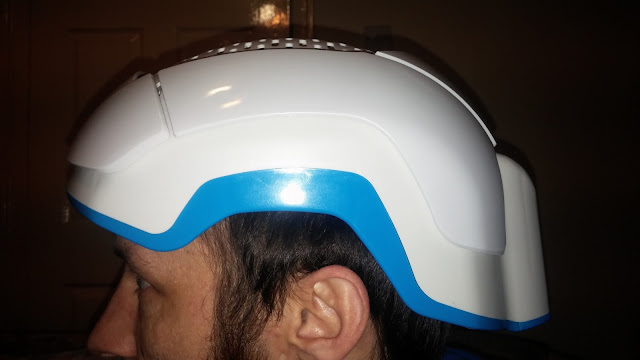 He loves that the helmet provides completely hands free treatment, allowing him to benefit from a laser hair growth session in the comfort of his own home whilst relaxing watching TV or playing a game on his PS4. He also appreciates the fact that as the helmet is rechargeable he can use it anywhere he wants without the hassle of power cords getting in the way or having to sit next to a power outlet. 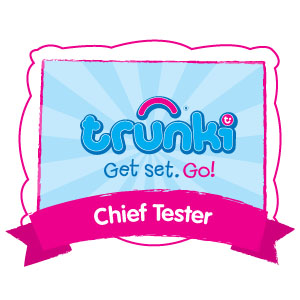 He likes the fact that a session is also only 20 minutes long and that the device features voice technology which tells him how long is left of his session……..this feature is very useful just in case he gets carried away with a game or gets immersed in a TV show and loses track of the time. The automated voice system also informs him if the helmet is low on power. You can also track how many treatments you have had thanks to the device’s automated treatment system. Over the course of the next few months Lee will be using the helmet religiously in the hope of seeing visible improvements. We will be updating you on any (if any) improvements have been seen along with new comparison photographs in a few months’ time. I really hope that our 1st update post will be one with visible results so that Lee can feel happier with his hair and gain a little more confidence which will help his mental well-being. 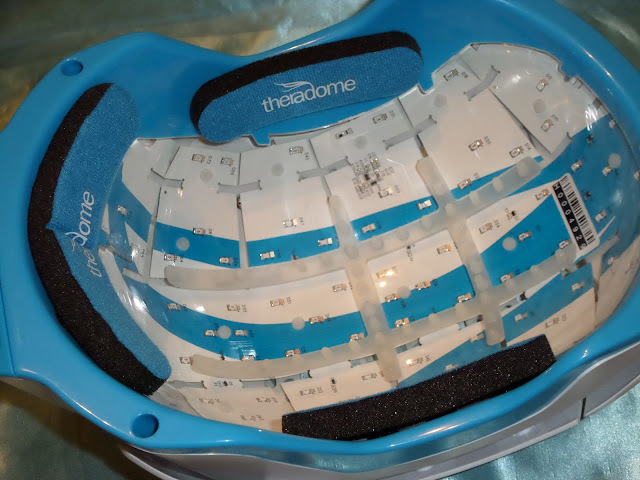 The Theradome Helmet retails at £649 and can be ordered directly from the Theradome website. Whilst this initial cost may seem a little steep when you compare to the cost of laser hair growth treatment at a clinic the price of the helmet is a fraction of the cost. 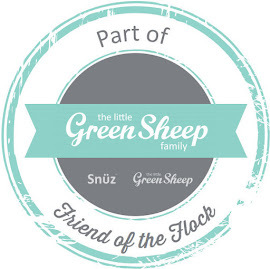 Add in the fact that once you achieve optimum hair growth you can continue with maintenance treatments from the comfort of your own home at no extra cost the cost-effectiveness is increased. 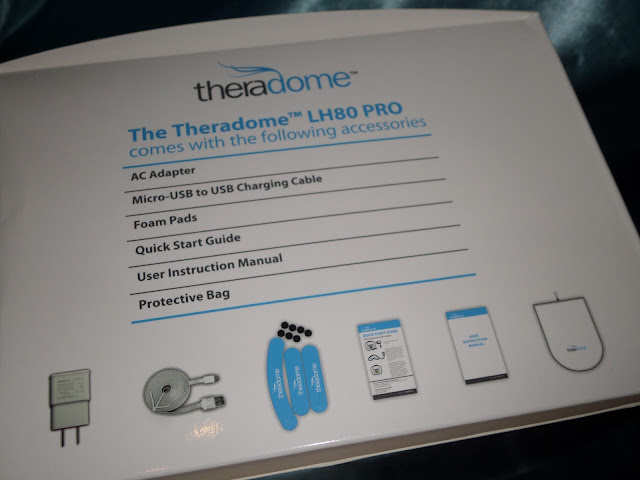 Additionally as the Therome can be used by multiple members of the household the device is even more worthwhile and reasonably priced. 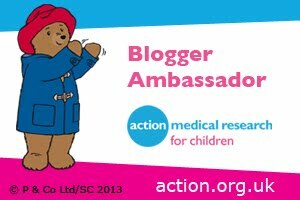 I found this a really interesting read! This looks like a product I need to try out I have very thin and fine hair and this looks like something worth trying. It has had good results with women from what I have heard and read. 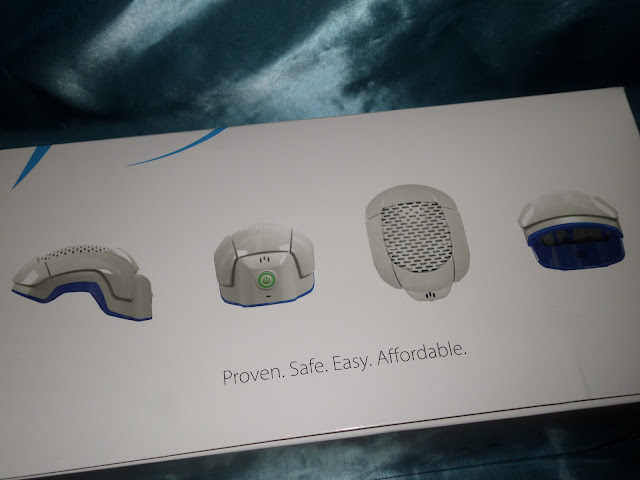 Agreed a very revolutionary and innovative product. I've heard and read that women have had great results with it. I am hoping it works well for the sake of my other half, will keep you updated. Hair loss really scares me. This looks like a great device although I'd be a bit worried about it frazzling my brain or something hehe.